Thank you for taking the time to read our first issue of Antigua’s Yachting Insider. The yachting industry in Antigua is active and vibrant and we think the time is right to make a single online source of information available for residents and visitors to Antigua alike that is updated regularly. Our objective is to communicate everything to do with the yachting industry prior to your arrival here, so you will share our view that Antigua is the yachting destination of choice. Regular content will include, among other things, a calendar of events, a “racing round-up”, highlights of yachting industry happenings, sport fishing and power boat news, Super Yacht news, yacht club news and Customs and Immigration updates. In addition, we will have a variety of monthly features highlighting such things as anchorages in Antigua and Barbuda, marine trades and local yacht charter businesses, Antiguan yachtsmen, industry training and development, and government and regulatory news. 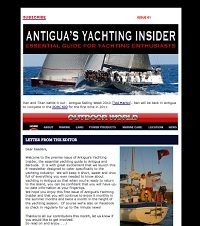 All content produced within the E-newsletter will also be available on the yachting pages of antiguanice.com. We hope you will come to view Antigua’s Yachting Insider as your source of yachting information and also as a means by which to spread your yachting news on a relevant and timely basis. If you have anything you would like us to include in the next edition, please send it to us at editor@antiguasyachtinginsider.com. Checkout the first newsletter here.